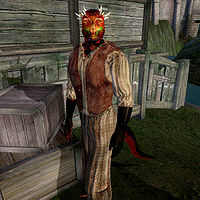 Reenum is an Argonian rogue living in Bravil, where he is a permanent resident at Silverhome on the Water. He doesn't really do much in his life, but appears to have a certain fascination with the canal that runs through the city. Every day, starting at 6am, he can be found in the area between A Warlock's Luck and the bridge, gazing at the water and at the southern part of town. At 6pm, he crosses the bridge and takes his dinner on the bench in front of the Lonely Suitor Lodge for two hours, before going back to his regular lookout post. At midnight, he finally calls it a day and returns to the Silverhome for six hours of sleep. He wears a simple set of lower-class attire consisting of a patched vest and a pair of coarse linens. His only possession is a small amount of gold. Reenum also knows a leveled set of rogue spells. His room in the Silverhome is located on the second floor, the first room on the left, and is pretty bare bones; it contains the usual random clutter, some spare clothing, a copy of Beggar Prince and, on the table, a bottle of Tamika's West Weald Wine. Reenum appears in a Loading Screen sketch, seen standing in front of the Bravil Mages Guild.